Skirts for Men Do Men Really Wear Skirts? To be honest I never imagined I would ever write a page called skirts for men, but due to the large amount of interest shown in this search term, here it is . Let me make something very clear right from the start, a man's skirt is not a kilt, and a kilt is definitely not a man's skirt. So what is the difference? 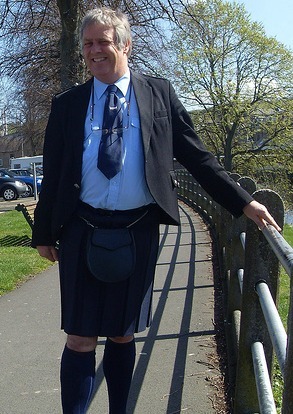 believe it or not, some people do think that a kilt and a skirt are one and the same thing. Well how many skirts have you ever seen, that have eight yards of material, well over six yards taken up in the pleats alone. Skirts, whether they be men's or women's are seldom made to measure, kilts on the other hand, at least quality traditional kilts, are almost always made to measure. Skirts for men often have pockets built into the design, I have yet to see an authentic kilt with a pocket, let alone pockets. 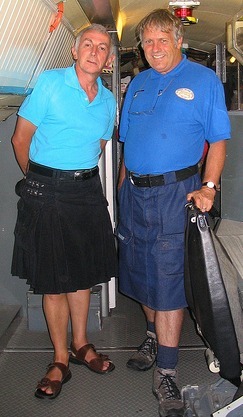 You do though see pockets being sewn into contemporary kilts, as in the photo below, on the left a modern contemporary kilt , on the right a man's skirt. The materials used in men's skirts also differ enormously from a quality kilt, the kilt of course is made from worsted wool, which will last a lifetime. Below you can see a photo of a denim cargo skirt, it has a zip fly, and side vents for freedom of movement, as opposed to the pleats on a kilt. Pockets are also included in the design. The next photo I have to show you is a skirt that is marketed as unisex. The Gentleman wearing it, Alex Cunningham, describes it as better suited to a woman's anatomy than a man's. He mentions particularly the front profile of this skirt being unsuitable for the male anatomy, and the need to wear a sporran to disguise this fact. There is no doubt that the fashion industry has been trying for a number of years to introduce skirts for men into mainstream fashion, largely without success. Within the last couple of years the attention of several top designers has again been focused on skirts aimed at men, and there are now several companies specializing in these skirts. The question is, will it ever become acceptable for men to wear skirts? or will they always be seen as feminine, and unmanly. The kilt after all is seen and accepted all over the world as totally masculine, and women love to see a man wearing a kilt. Would she feel the same way about a man wearing a skirt? I'm not so sure. Fashions come and go as we all know, and I wouldn't care to guess how long men's skirts will be with us. Kilts on the other hand, have been with us for well over three hundred years. And a kilt is the only item of clothing I know, that never goes out of fashion. If you have any questions or comments about skirts for men, then please drop me a line using the contact us page, and I will gladly answer them.